What’s that? You’ve never heard of Tanoshi? No sh*t. It’s on 73rd and York. I had no idea that there were people on this part of the island, let alone noteworthy restaurants. In my mind, this neighborhood is basically a hospital and a bunch of empty apartments that you see on Craigslist for $1400 a month. Is that a murphy bed in that photo? Yes it is. Welcome to New York, kid. 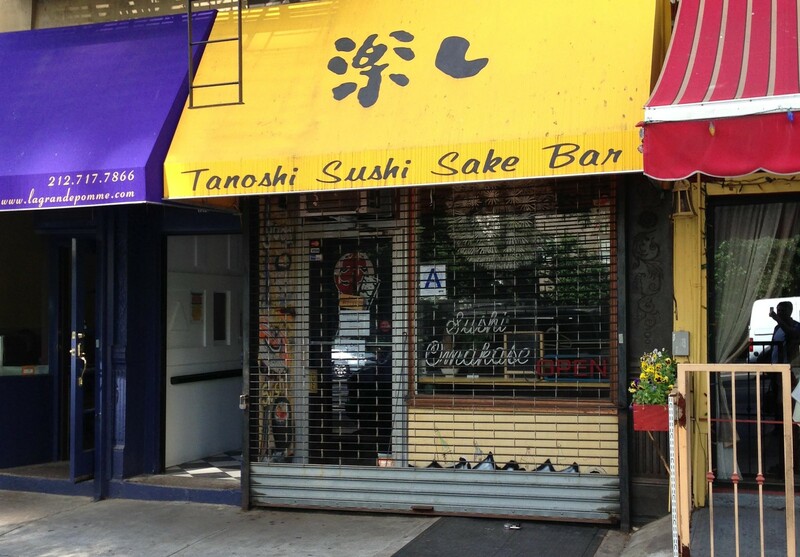 But ask any of your sushi-obsessed friends, and they’ll tell you - Tanoshi is the real deal. That’s actually exactly the story that led us to Tanoshi Sushi. One of our own omakase-obsessed friends was raving about it a few weeks ago, and then it seemed like suddenly everyone we know was trying to get a reservation. And getting a reservation is no easy task. Tanoshi is only ten seats around a counter, and they do three seatings a night. It used to be that you had to come to the restaurant at 1pm to put your name on the list. Fortunately, they now accept online reservations. Luckily it didn’t come to fisticuffs for us to eat here. After a full omakase meal with some appetizers and a few other extras thrown in, we’re happy to tell you that Tanoshi is as good as people say it is. This is one of the best sushi experiences you can find in New York City, and it comes at a better price than all of its contemporaries. The basic omakase starts around $95, which is pricier than it was a few years back, but also still more affordable than some of the city's other top spots. It also helps that it’s BYOS (bring your own sake). Ultimately, Tanoshi is a restaurant that's worth checking out, especially if you’re one of those sushi obsessives we keep mentioning. We’re betting you’ll like this dingy little hole in the wall more than whatever your current overpriced go-to spot is. You may even find yourself coming up to York Avenue every once in a while just to eat here. Maybe you should scope out some real estate while you’re at it. We saw an alcove studio nearby on CitiHabitats that looked pretty appealing. I think it even comes with a futon. Tell the sushi chefs if there's anything you don't like - otherwise, they'll be the ones driving. Expect some unusual pieces, like scallop topped with toro, or uni with salmon roe and a quail egg.